It's been said that one should not judge a book by its cover, though if one is to judge anything of an author by his book's cover, Jose Canseco is pretty impressed with himself. 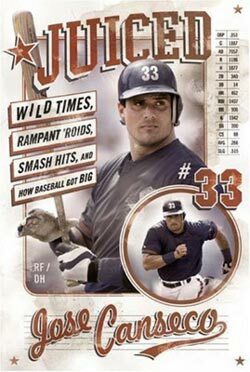 The cover of Juiced : Wild Times, Rampant 'Roids, Smash Hits and How Baseball Got Big, (Regan Books, $24.95, though you should never pay that much) besides somehow managing to fit the longest baseball title since "The Bingo Long Traveling All-Stars and Motor Kings," also includes not one, but two pictures of Canseco, his #33, his position (RF/DH) and his career statistics, and that's just on the front. The back cover has yet another picture of the author, a beefcake shot of him flexing his bicep while holding a bat, with the title "The Chemist" above it, and a self-quote below. Not bad, if he does say so himself, and he does. Several times. One of the first things I discovered as I read Jose Canseco's new book was that most of the reviews I had seen had not done the book justice. For one thing, 90% of the quotes they used had come right out of the introduction. I doubt most reviewers had read much farther. Another problem was that the articles I had seen about the book had seemed to discuss only the steroid-related topics in the book, whereas I found the book to be much more comprehensive than that. I hope that this thorough review will offer you a much clearer picture of Canseco and his book. Don't get me wrong: Juiced is about steroids and other performance-enhancing drugs. It's got that title for a reason. But the story doesn't start there, and Canseco knew enough as he wrote the book to know that he couldn't keep most sports fans interested for almost 300 pages if all he discussed were drugs, dosages and dropped names. Canseco spends several chapters discussing his family history and upbringing, breaking into the big leagues, and becoming an MVP. He also spends a chapter on women (plus an entire chapter on his relationship with Madonna...hint: it was pretty tame), a chapter on cars, one on dealing with the press, fatherhood, the 1994 strike, and several chapters on the twilight of his career. I should say, "Jose's perceived reasons for the extended twilight and premature end of his career", but that comes later. The book starts with his parents' reasonably successful life in Cuba, and their flight to Miami upon Fidel Castro's takeover. Jose and his siblings grew up in Miami, and Jose maintains that he was something of a runt as a youngster. He and his twin brother Ozzie learned to play from thier father when they were little, though his father wasn't always as encouraging as he would have liked. Much of what Canseco writes must be taken with a grain of salt, in my opinion, as the book is clearly written with an agenda in mind, namely to prove that Jose Canseco's career as a professional baseball player is almost entirely due to his usage of anabolic steroids and human growth hormone. "I was always a scrawny kid, not very athletic, and in my wildest dreams I couldn't see myself playing at the major league level," he tells you, and then he tries to play down the fact that he was the MVP of both his JV and Varsity baseball teams in high school. Harrumph, I say. There aren't that many kids drafted out of high school by Major League Baseball teams, fewer still as low as the 15th round. The dude must have had some talent, right? He might not have had such a prolific and prolonged career without the aid of steroids, but he certainly could have been a major leaguer for some time. His brother Ozzie had essentially the same genes, and he made it to the majors, albeit briefly, without much help from steroids, though Jose attests that his twin dabbled a little in the juice as well. Other names he mentions in the book, besides the big names like Mark McGwire, Juan Gonzales, Rafael Palmiero and Ivan Rodriguez, include Wilson Alvarez, Dave Martinez and Tony Saunders. For all of these players he purports to know first-hand of their steroid use. Canseco also discusses his suspicions about Sammy Sosa, Barry Bonds, Brady Anderson, Bret Boone and Roger Clemens (though he does say that the Rocket never "touched down" in any woman's bed besides his wife's, as far as Jose knew). The 2001 spring training conversation he "recalls" with Boone has already been debunked by ESPN.com's Jeff Merron here, along with a few other of Jose's fuzzy recollections. Some of these are details, like whether he pinch hit for David Cone in Game 4 or Game 6 of the 2000 World Series. Others are pretty substantial mistakes, like his account of a monster home run he hit off Walt Terrell in Detroit in 1986, which was actually hit in 1987. By Mark McGwire. Small detail. Here's one that Merron didn't discuss: In Chapter 19, "The Godfather of Steroids", The Don discusses a home run derby in which he participated in February of 2000, along with other sluggers like McGuire, Palmiero, and Bonds. He says that Bonds was amazed by his physique, as well as the fact that he won the contest, hitting at least one blast that landed "maybe 550 or 600 feet from home plate." "So what did Barry Bonds do that next off-season? He showed up in spring 2001 with forty pounds of added muscle. As soon as he set foot on a field in Scottsdale that spring, he was all anyone could talk about." Well, the evidence does not support Canseco's inference that this experience led Bonds to steroid use. Bonds had missed a third of the 1999 season with injuries, but managed to hit 34 homers in 355 at-bats despite that, and was in fact, invited with other elite sluggers to the aforementioned home run derby. Bonds bounced back nicely from those injuriesin 2000, though, hitting .306, tying his career high with 129 runs scored (in 143 games) and setting new personal bests with 49 homers and a .688 slugging percentage, all at age 35. It seems more likely that Bonds' steroid use was a response to the 1999 injuries he suffered, and that the wheels were in motion well before he traveled to Las Vegas that February. Canseco's opinions on his status as a Latino, and the influence it had on his young career, is also a bit suspect. While I don't doubt that racism existed at that time in MLB organizations, and that it still does in some forms, I don't see how the major leagues were as "closed" as he contends. In 1985 alone over 100 players, nearly 10% of all major leaguers, hailed from a predominantly Spanish-speaking country, according to Baseball-Reference.com. Latinos had played and played well in the majors for decades before Canseco came along, with MVP winners such as Roberto Clemente, Orlando Cepeda, and Willie Hernandez, as well as fellow Cuban Zoilo Versailles. Hernandez and another Cuban, Mike Cuellar, hasd also won Cy Young Awards, and practically countless Latinos had won Gold Gloves, Silver Slugges, and other acclaim in major league baseball. A few narrow-minded hicks who happened to manage minor league franchises may have been rotten, especially towards someone they perceived as a "hot dog" or a "goof-off" like Jose. That, however, hardly spoils the whole bunch of major league owner-apples, and is far from the pervasive conspiracy to keep the Latinos down that Canseco describes. Sketchy recollections and thinly-veiled agendas aside, the book isn't bad. Canseco's smart enough to know that someone else should write his books for them, and Steve Kettmann, his ghost writer, does a good job of putting Jose's words into, well, Jose's words. It's not eloquent or elaborate, but it's not Hemingway either. It's just plain talk, easy to read (unlike some of my stuff) and reasonably interesting. It's part revisionist history, part biased biography, and part "how To" guid, both for how to become a major leaguer (HINT: there are needles involved) and how to act when you get there (HINT: Don't date Madonna; DO be nice to the Press). Despite my criticisms, I actually do recommend reading this book. Just try to do it with some access to the record books nearby, just in case. For all its flaws, Juiced really was interesting. Imperfect, with some big holes and lots of unanswered questions, but a fun ride nonetheless. Kind of like it's author. It's McGwire ... not McGuire.